RealClimate.org – down | Watts Up With That? I figured I’d better note this since a number of people have brought it to my attention. Trying to reach realclimate.org was giving a 502 error much of today, which is likely due to an internal problem with their database used to run WordPress. They run a custom version of wordpress code and theme on a LAMP configuration, and it appears the PHP code can no longer communicate with the MySQL database. Confirm that the application is running. If the application crashed, was terminated, or has not yet started following a system reboot, the application must be restarted to respond to requests. If the application was terminated, you will receive a notification email with additional information.To restart the application manually, please see your application type’s documentation or control panel entry for instructions.Most stopped applications are automatically restarted during periodic cron jobs. Please see the application’s entry in the control panel for details. Confirm that the application is listening to the correct port. Check your application’s configuration to make sure that it is listening to the port assigned to the application in the control panel. Gavin is probably pulling out what little hair he has about right now. This is why I use wordpress.com – I don’t have to worry about maintenance, hacking, updates, or other server related issues. Based on the return codes, the issues at RC today are likely due to internal code or maintenance problems, so I wouldn’t speculate beyond that. ← Would You Give This Man a Ride? I still find it amusing that given how much they deny the sun’s influence on climate, they have the sun in their banner and you dont…. And what a bad pseudo gateway it is to climate science. Hi Mike – all they care about is giving the impression of great heat – and hope people don’t do something really radical like think about it. Given the high traffic of your site, does it ever get overloaded? Or do you solve that by buying extra bandwidth? Usually I’ll see a sign that says “Wet paint” and won’t touch the paint to see if it’s still wet. Why did I rush right over to RealClimate to see for myself? I can connect, but I don’t get anything back. LAMP with MYSQL makes for a fairly nice web platform until it doesn’t. At that problem you have a major project on your hands fixing it. Musta been the global warming that got to his CPU or something. @Bradley, the major problem is the core database and its server. You have to do transactions to it and not get locks. Bandwidth turns out to usually be the least of your problems in the long run. You know, Anthony, a truly decent human being would contact Gavin and offer to host all his posts until he’d resolved his issues. Kind of in the spirit of Trenberth meeting with skeptics…. Uh… your moderators would, of course, continue to handle the moderation duties. Just my feelings too. Like a Freudian slip they show the sun and like a second Freudian slip they show it as angry. Truth will out. Oh, gosh, Betsy must be pulling out her hair about now. Maybe now she realizes solar hosting might not be such a great idea after all. RC is green technology. Only works when the wind blows government grants in their direction. The green you see is your $$ going down the toilet to help “the Team” live large. Yeah, the ability to code for a supercomputer makes a mere webserver a piece of cake. I don’t know how many times Warmista have implied that they understand their supercomputer code so well that reading it is as easy as reading a physics text. What could go wrong? Maybe their part of the stimulus ran out and they won’t be back up till the “Jobs act” is passed so they can get their jobs funding. Yes, but Gavin doesn’t have to worry about traffic…. Maybe their proxy server is upside down. Theo, as most of their released code has proven to be Matlab, FORTRAN, or other codes which have been readily duplicated by non-progammers (Steve McIntyre is a mining engineer not a programmer, but has duplicated Team studies repeatedly in R), you need to be careful throwing that supercomputer coding idea around. People have been duplicating their “supercomputer codes” on desktop PCs all over the world. Hmmm … time yet for a sidebar category titled “Down” ? Does Mr. Soros get a refund or a credit note? I’d put my money on that they have run out of disc space… Usually something you can plan for and the OS should be been screaming into the log files that the ceiling was fast approaching..
Maybe they’re part of the IPCC Cloud and are now frantically cleaning house. Hilarious! You must have spent ages thinking of that. Stevo, you really need to develop a sense of humor. Gavin has a problem with his site that would lead most of us, many with IT skills, foaming at the mouth. Many of us would not wish it on a nicer person. I’m twice his age and have twice the hair. I think I don’t have enough. Hope Gavin has a better response than hair-pulling. It’s wonderful how much I’m not interested. Isn’t that the standard server response to FOI? Y’all are nuts! Clearly the site is possessed of demons. Apparently the IT guys have been told to take Steig’s Matlab class before they can fix anything which is slowing things down a bit. Also, it turns out one of the techs doesn’t have his PhD in Radiative Physics yet. While I am normally loathe to dispense free medical advice, Gavin should prepare a hot, moist herbal poultice and lay it upon his server to draw out the evil humors. My guess is that it just got suicided in order to prevent any IPCC related FOIA requests. Or someone has seized their database. That is another possibility. Quote of the week! Thanks, Bob! Maybe a denial of sevice hack from some of those Anonymous people, mistakenly thinking it was a Skeptic site…. Will give them more time to read “The Spoiled Child”. So RC is down? No great loss to humankind. I’d noticed that before too. 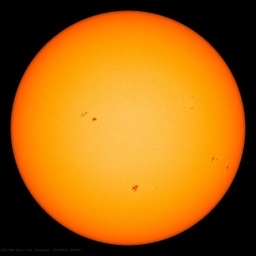 Looks like their sun’s at solar maximum too. Perhaps all their tech people are out supporting an “occupy something effort” somewhere ? … and just for a few days at least, the Internet was slightly less stupid. Still: “503 Service Temporarily Unavailable”. Who pulled the plug on this (private? – government?) project? Maybe Gavin is trying to cover his tracks so it can’t be shown as to how so very much time he has spent blogging and posting and moderating a website while on the taxpayer’s clock. It’s 8:54 Arizona Time (which is the same as Pacific Daylight time since AZ doesn’t go on daylight savings time), and RC is back up . .
Anthony/mods – Who has the sense of humor? It’s bad Karma to use a computer to make light of people having computer problems. Has anyone blamed the ‘Skeptics’ yet? Maybe they Bore Holed themselves. I bet every cynical clickthrough from WUWT quadrupled their traffic hourly! The RC server is not running, it’s drooling. Now because of this failure of ‘service’ for so many hours, and taking a lesson from RIM, we all deserve an apology in the form of $100 worth of free downloaded programmes, each. I will accept, for my entire $100 credit, a download of the programme used to generate the CRU temperature output files, fully annotated by HarryReadMe. Thinking the same, Gavin’s been enlarging the borehole and the censorship props failed dumping the site in with the rest. Think of all that accumulated crud they carried and of course we know they are not meticulous engineers!! When you have a website that already lies in their header image, you shouldn’t expect truth below that (The same holds for SkepticalScience). No mention of outage…perhaps really they don’t expect anybody to notice. So now there are hundreds of True Believers going to argue “502 Error” against evil deniers. Was that comment really necessary? Anyway, the Borehole is available again. Best part of the entire site. I wonder if there were any hidden/password access forums on there that have mysteriously vanished ? We are still on daylight saving time. PDT. It’s just been announced that Gavin Schmidt will be the recipient of AGU’s first Climate Communications Award. According to a leak from an engineer fixing RC’s X-Box/Commodore 64, the problem was down to ‘parasitic oscillations due to inter-stage feedback in the Eccles-Jordan mono-stable double diode flip-flop’. harry did not work on CRUTEMP. so many people get this wrong. the harry readme does not refer to ANY work done on hadcru. Its an entirely different dataset that nobody even uses. Only an idiot studying to be a moron would even consider running critical apps on a light weight DB engine such as MySQL. They should only be using an enterprise level one such as Postgres, Ingres, etc. Was this fixed on company or personal time and who is paying for it? Might want to have a little chit chat with the folks over at Slashdot who for many years did a helluva job running Slashdot on MySQL. Considering the load and demands put on it – “light weight” is a little harsh. Coincidence? The front page is a loving paean to Gavin, recipient of some award or other, probably written by Gavin. It’s an infinite loop problem. Probably a DDoS attack by climate deniers.